Once in a while, we encounter an architectural project so inspiring that it can be called "biblical in proportion." The pyramids, the Pantheon, and the Hagia Sophia, for example, strike us with a a sense of awe and have the ability to move us with their astonishing grace and power. But it's not every day that architecture can be calledliterally biblical. Ark Encounter, a theme park that will include a full-scale replica of Noah's Ark based on descriptions from the Book of Genesis, is one design that can, and it's currently under construction at the Creation Museum in Petersburg, Kentucky. The man behind this enormous feat is Ken Ham, founder of the Creation Museum, who recently made headlines after a televised debate with Bill Nye "the Science Guy." The theme park employs a spatial experience to convey the glory of the Old Testament and provide a counterpoint to America's modern-day cultural degeneration. Plus, there will be a petting zoo! However, the project is in financial trouble, and supporters are being asked to sponsor a peg, a plank, or even a beam in the evangelical equivalent of "participatory design." 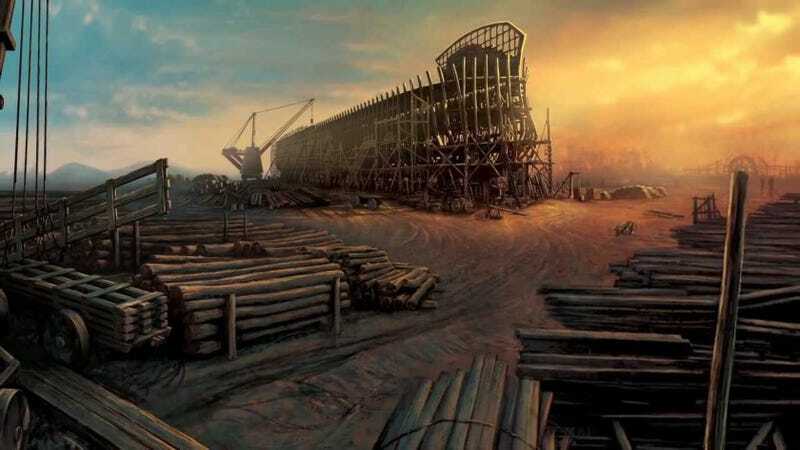 The plan is for the theme park to survive any upcoming apocalypse (whether it be a fire, flood, or brimstone), fulfilling in part the story of Noah's Ark. What makes this project so weird is the divorce of meaning and context that results from taking the marine structure and placing it in a new landscape (think Hans Hollien's "Aircraft Carrier in Landscape"). The Ark Encounter copies the form but not the function of the original, creating a dissonance between the story we know and the story into which we are projected. The original was built to survive a flood; using the replica to spread the message of the Old Testament is intriguing, if not a bit terrifying. The architectural doppelgänger is not a new phenomenon. One outrageous example was the proposal to build a full-scale Starship Enterprise in Downtown Las Vegas' Fremont Street. The functional disconnect was strong in this project; money was nonexistent in the Star Trek series, but the spaceship-turned-entertainment-complex, complete with casino, would no doubt have accepted currency. The entire Las Vegas strip essentially comprises forms and experiences that are appropriated from reality, creating simulations of vacations from around the world (with the added benefit of casinos and other entertainment complexes, of course). The New York-New York Hotel reproduces the skyline of the Big Apple; Paris Las Vegas Hotel is a replica of the Eiffel Tower; and The Venetian Resort is a sophisticated copy of parts of Venice, Italy, complete with gondola rides.